AURORA | Kenny Foster’s last game of many over his four-year career on the floor at Smoky Hill came Saturday and he made it memorable. Just a day after the Buffaloes’ Wyoming-bound senior star received the Colorado’s Gatorade Player of the Year award, he tallied a game-high 25 points to help Team East to a 112-103 victory over Team West in the A-Town All-Star Game, presented by Sentinel Colorado. Before he played in the A-Town All-Star Game for the fourth time in as many seasons — teaming up with longtime friends Dayne Prim of Grandview and Eaglecrest’s Aaron Bokol — Foster threw down a 360-degree windmill dunk to win the slam dunk competition (see video above). Bokol poured in 17 points, Hinkley’s Larenzel Jones added 14 — including three consecutive 3-pointers that put his team ahead for good in the final two minutes — and Prim added 13 for coach Michael Rogers’ (Grandview) Team East, which had seven players in double figures in all. Coached by Shawn Palmer of Rangeview — which was crowned Class 5A state champions a week earlier — Team West couldn’t hold a late lead despite hitting 14 3-pointers in total. Eaglecrest sophomore Ty Robinson, the runner-up to Foster in the slam dunk contest — poured in 17 points, while Rangeview’s Christopher Speller, Gateway’s Noah Harrison and Smoky Hill’s Jalen Weaver contributed 12 apiece. Team East built an early lead with the help of five quick points from Overland’s Graham Ike, as the 6-foot-9 junior makde a layup followed shortly by a 3-pointer to put his team in front by seven. The outside shooting of Harrison, Grandview’s Lian Ramiro and Rangeview’s Jodaun Dotson helped keep Team West close. Harrison tied Jones with a game-high four 3-pointers and his second of the opening half just before the buzzer cut Team East’s lead to seven points. 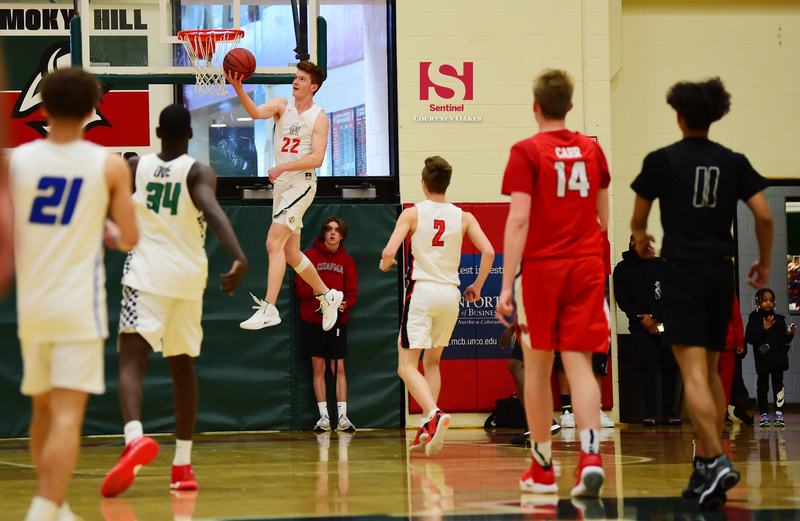 Notes: Regis Jesuit senior Jamil Safieddine, Grandview junior Caleb McGill and Smoky Hill junior Quinten Rock were selected for the game, but were unable to play due to injury or prior commitments. Kenny Foster (Smoky Hill) 11 1-1 25, Aaron Bokol (Eaglecrest) 7 0-0 17, Dayne Prim (Grandview) 6 0-0 13, Graham Ike (Overland) 5 0-0 11, Davon Walker (Grandview) 3 0-0 7, Isaac Tesfaye (Cherokee Trail) 5 0-0 10, Larenzel Jones (Hinkley) 5 0-0 14, Zion Ruckard (Eaglecrest) 2 0-0 4, AJ LaCabe (Vista PEAK) 5 0-0 10, Hezekiah Swanson (Overland) 2 0-0 4. Totals 51 1-1 112. Jodaun Dotson (Rangeview) 2 0-0 6, Lian Ramiro (Grandview) 4 0-1 11, Daniel Carr (Regis Jesuit) 3 0-0 8, Christopher Speller (Rangeview) 6 0-0 12, Noah Harrison (Gateway) 4 0-0 12, Malachi Owens (Aurora Central) 3 1-2 9, Ty Robinson (Eaglecrest) 8 0-0 17, Quincey Jewett (Rangeview) 3 0-0 6, Jalen Weaver (Smoky Hill) 5 1-1 12, Jaerron Hunter (Vista PEAK) 3 0-0 7. Totals 41 2-4 103.